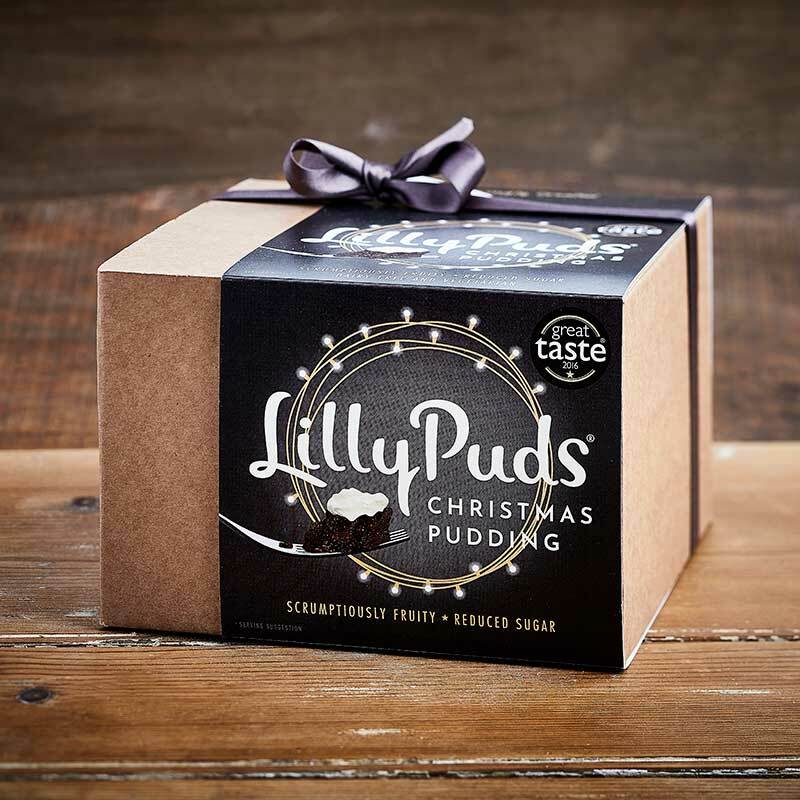 LillyPuds Christmas Puddings are packed with scrumptious fruit and full of natural goodness. We are passionate about the Great British Christmas Pudding! Over 50% fruit, Reduced sugar, Vegetarian, No milk ingredients, No mixed peel. LillyPuds handmade award-winning Christmas Puddings, a deliciously light and fruity festive delight. LillyPuds Gluten Free handmade Christmas Puddings, deliciously light and fruity – a festive treat! Deliciously light and fruity – ensuring a fair deal for farmers and workers in developing countries. At LillyPuds we work hard to ensure our products are free from unnatural ingredients wherever possible. There is no need to add unnatural products when perfectly natural ingredients are available. Instead of margarine, we use butter in LillyPuds Sticky Toffee Pudding and sauces and plentiful amounts of fruit in our Christmas puddings. Our Traditional and Gluten Free puddings are made with a locally sourced gluten free ale, the Brentwood Brewing Company Chockwork Orange Beer – a classic ‘old ale’ style which compliments the pudding mix perfectly. So what makes a LillyPuds Christmas Pudding so scrumptiously light and fruity? With no mixed peel, over 50% fruit and less added sugar and flour, a LillyPuds naturally sweet Christmas pudding is a festive delight. LillyPuds Christmas puddings, Traditional, Gluten Free and Plum Pudding are suitable for vegetarians and contain no milk ingredients. Our puddings also only contain responsibly sourced palm oil. So, say goodbye to a dark, heavy Christmas pudding and say hello to a scrumptiously light and fruity LillyPud! So often, gluten free products can be dry and unpalatable – not a LillyPuds Gluten Free Pud! The Gluten Free and Vegan (also Gluten Free) recipes are a slight adaption of the Traditional Christmas Pudding mix, preserving the light and fruity texture. 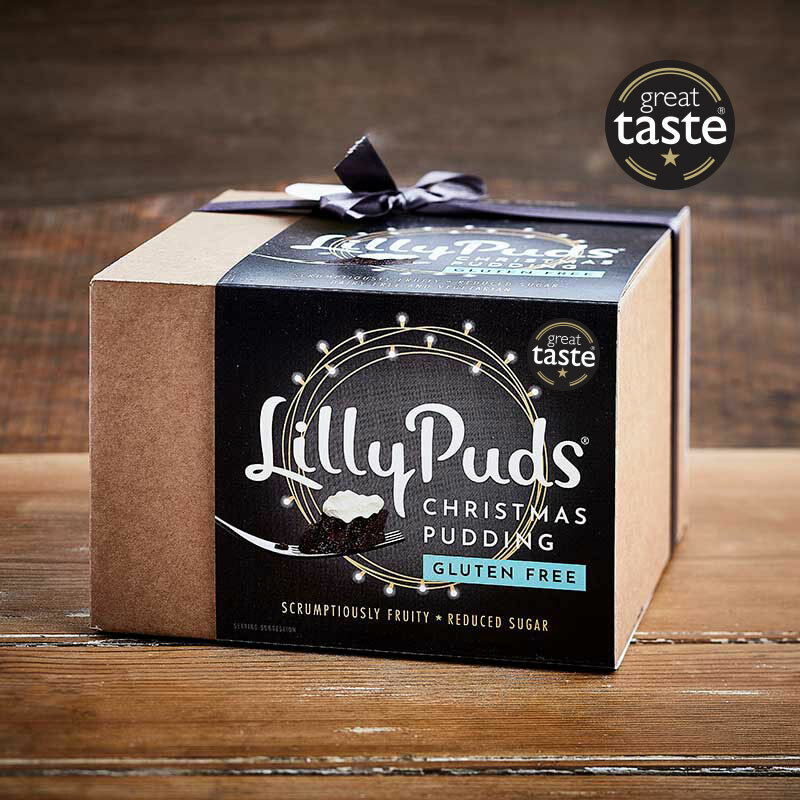 So, these LillyPuds puddings do not compromise on taste and texture – a delicious blend of over 50% fruit, just 5% added sugar, less flour, no mixed peel all gently folded together with gluten free ale and brandy. Festive delights to be enjoyed by all diners not just those with dietary needs. There is no doubt, gin has undergone an amazing resurgence over the past years.It was time to seize the moment and develop a LillyPuds Plum Pudding laced with fruity damson gin. Finest sultanas and raisins are blended with walnuts, stout, prunes, apple, brandy and sloe gin with the pudding finally generously laced with a fruity damson gin. The LillyPuds yummy Plum Pudding is scrumptiously light with a soft fruity texture complemented by the fruity gin.It is also suitable for vegetarians and does not contain any dairy ingredients. There is no doubt, gin has undergone an amazing resurgence over the past years. It was time to seize the moment and develop a LillyPuds Plum Pudding laced with fruity damson gin. Finest sultanas and raisins are blended with walnuts, stout, prunes, apple, brandy and sloe gin with the pudding finally generously laced with a fruity damson gin from Oxton Liqueurs. The LillyPuds yummy Plum Pudding is scrumptiously light with a soft fruity texture complemented by the fruity gin. It is also suitable for vegetarians and does not contain any dairy ingredients. Following on from a customer request, our thoughts were turned to how LillyPuds could make an ethical contribution. 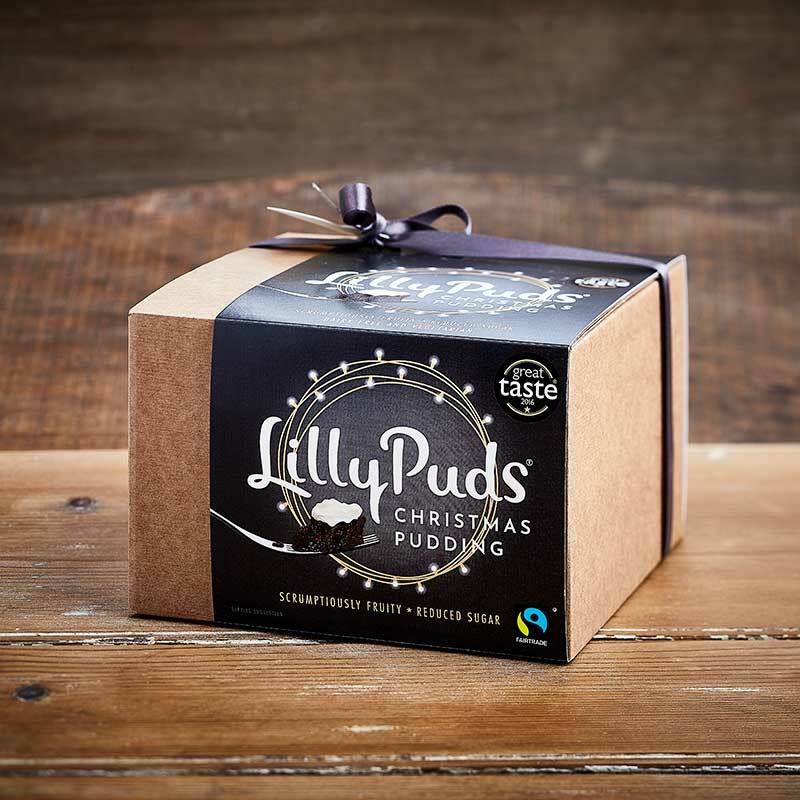 The LillyPuds Fairtrade Christmas Puddings uses vine fruits from farmers in developing countries who are assured a fair deal for their products. This is our small way of giving back together with only using responsibly sourced palm oil in our puddings. Every little helps! 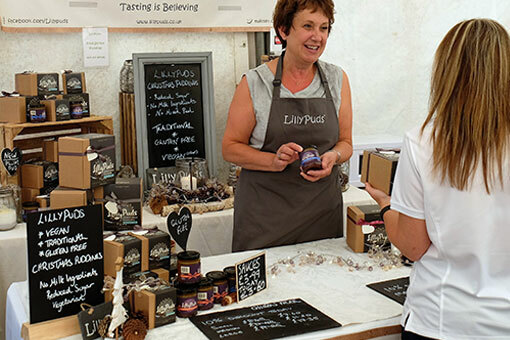 LillyPuds will be attending events all around the south of England this year. On our events page we have details on where you can find us. This list may be updated, so make sure to check back for the latest events. We look forward to meeting you!